I am looking for a Windows graphical utility for performing HTTP operations. POST to http://example.org/test/service With a POST body: "Data goes here"
Does anyone know a good piece of software for doing this? I too have been frustrated by the lack of good graphical http clients available for Windows. So over the past couple years I've been developing one myself: I'm Only Resting, "a feature-rich WinForms-based HTTP client." It's open source (Apache License, Version 2.0) with freely available downloads. It currently has fairly complete coverage of HTTP features except for file uploads, and it provides a very good user interface with great request and response management. RestClient is my favorite. It's Java based. I think it should meet your needs quite nicely. I particularly like the Auth suppport. Have you looked at Fiddler 2 from Microsoft? Allows you to generate most types of request for testing, including POST. It also supports capturing HTTP requests made by other applications and reusing those for testing. You can use Microsoft's WFetch tool also. This is a good tool for all HTTP operations. I like rest-client a lot for the purposes you described. It's a Java application to test REST-based web services. Honestly, for simplistic stuff like that I typically whip up a quick HTML form in a local file and load that up in a browser. If anybody is still interest Eclipse Labs Rest Client tool is an excellent choice. I'm trying it in Windows in an EXE version and works smoothly. I've worked also with Rest Client previously and its great too. works from Android Tablets & Phones. Flexible enough to try various combinations. Not the answer you're looking for? Browse other questions tagged windows http rest client or ask your own question. 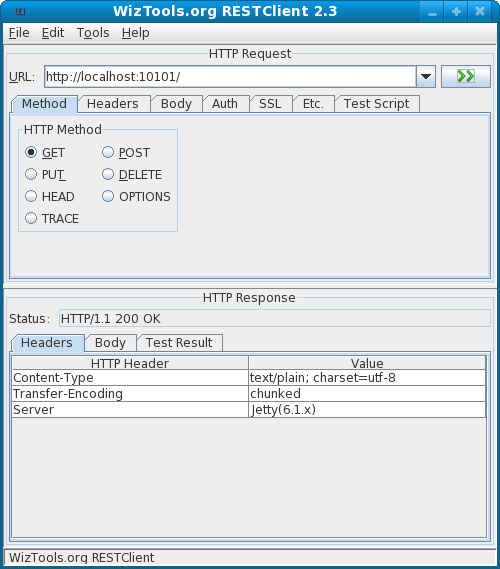 GUI Program to send raw http requests in Windows? HTTP status code for update and delete?